Believe me, this is something we have asked ourselves countless times since embarking on our full time travel adventure. In the UK there are very clear laws, rules and etiquette surrounding dogs and their care. This is something we have really noticed while travelling through Thailand, Sri Lanka and Bali, and something that we will definitely appreciate when we are in the UK next! 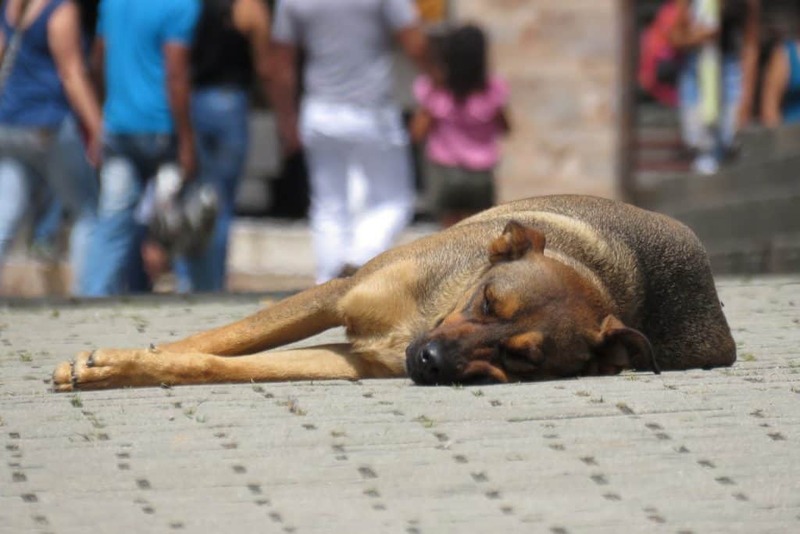 To put the issue of dogs in South East Asia simply, think about this simple truth: When we walk out in any quiet residential or rural area, especially at night or in the early morning, we are at very real risk of being bitten and/or mauled to death by dogs. I wish I was exaggerating but I’m not. Serious injuries and deaths via dog attacks are very common; a friend we met up with in Thailand had experience a dog attacking her 7 year old daughter, which has left its mark both physically and emotionally. Unfortunately our family has experienced three horrible episodes involving aggressive dogs since we left the UK and it has prompted us to take our safety when out and about far more seriously. The first incident that we had was here in Bali, back in October. There is a dog who lives around our apartment block; he technically belongs to someone who works near to the apartments, but they leave him frequently to go away on business and consequently the maid who lives here is responsible for him. He is two years old and has had absolute zero training. In the day dogs here are let out to roam the streets, often because their owners can’t afford to feed them, so they fend for themselves. Mowgli, this dog, does this and we frequently hear him fighting with other neighbourhood dogs. Many people can’t or are not aware of the need to provide good vet care for their pets, and this time when we came back to the apartments we found that Mowgli had been hit by a scooter. He is ok but he is wandering around in the street, in pain, which is much more likely to spark a bad encounter with other people or dogs. Last October Mowgli wandered into our ground floor apartment. Patrick told him to leave, gently but firmly- Mowgli kept coming in. Patrick opened the patio doors and guided him out- as he was half out of the doors, Mowgli turned around and bit him, leaving a deep cut on Patrick’s forearm. Cue the usual rabies worry and palaver, which thankfully did not end in medical intervention. The second experience was the worst in terms of duration and fear factor- and, you know, potential hideous and gory death- and happened in Ella, Sri Lanka (check out our guide to this gorgeous area here). Mum and I were on a hike up to Ella Rock; a very popular tourist attraction. We thought there would be a lot of people on the path but as it turns out most people go in the morning, and we went in the late afternoon. A dog started following us and seemed very chilled out, so we basically ignored it (there are strays and wandering pets everywhere so it wasn’t really of note). Our walk took us through dense woods to the top of what is essentially a mountain; the sun was going down so we turned around to go back. We noticed that the dog had acquired a friend, so now two dogs were with us. I mentally noted this but wasn’t really worried as they seemed quite involved in themselves. Then a third, fourth and fifth dog appeared, out of nowhere. Mum and I weren’t happy but didn’t have any option other than to continue down the path and try and get to civilisation as quickly and calmly as possible. A few minutes later, the dynamic in the dog group seemed to change as two of the male dogs tussled over a female. They started snapping and growling at each other, which made the other dogs tense, and soon they were snarling around us. It was pretty horrible. At that time neither of us had read about how to deal with groups of dogs/ dog attacks. I picked up a large rock while Mum edged forward through the woods. Then the original dog began snapping at Mum, at her ankles. Thankfully she was wearing those really baggy harem pants which got caught in its teeth, giving her time to step back and start yelling at the dogs. I raised the rock and started shouting at the top of my voice and we both made ourselves as big as possible. This seemed to keep them at bay a tiny bit; the dog kept half-going forward and then thinking better of it as we shouted. It was pretty hideous as the floor of the woods was covered in leaves, mud and scree, so we kept slipping and ended up covered in mud. This went on for about half an hour, which felt like an eternity. Eventually another dog appeared and seemed to get the attention of most of the group- three of the dogs followed us for the next 40 minutes but didn’t do anything. The most recent incident was a few days ago. We go to eat at the same warung (cheap local eatery) each evening, and often I take our Tupperware there, order and bring it home in the containers. I walked in and didn’t have time to react as the resident dog (that we see every single day and is usually fine) flew out from underneath a table, jumped up and bit my leg above the knee. It didn’t break the skin badly, just a graze, but it was a decently strong bite and I ended up with a large bruise and swelling. Later when Patrick went to get out food he found the owner of the cafe shouting and the dog and stamping his feet at him, which is obviously going to do nothing except scare and confuse the dog. It’s incredibly frustrating, being surrounded by dogs who, if they had the right environment, would be perfectly happy and chilled, yet behave in ways that endanger both themselves and other people because of neglect. There are lots of rescue facilities on Bali which is great; what is also sorely needed is comprehensive education on how to care for and train dogs. We have applied to foster some pups from local rescue organisations and are hoping to help with the next generation of lovely dogs on Bali. Are you surprised? Are dogs something you would consider a risk while traveling? To check out our Thailand posts, click here. For Sri Lanka posts click here and for our Bali tips and stories click here! Yep! Except it was a little different. We had a kitten living with us at our house in Sri Lanka. She had scratched and bitten my 3-year-old. I was unsure if our one year old had been scratched/bitten. Then the kitten scratched me – blood, etc. The issue came about when the kitty promptly died. We went to the hospital, and we need immunoglobulin and a series of injections. I have worked with street dogs in India – Anti-rabies animal birth clinics – so I already had been pre-vaccinated. They refused just to give me the booster. My poor sons had to have all the injections. The worst part was it took 12 hours in total, and we were not allowed to eat “in case you have a reaction and need to be intubated.” I think we counted we got jabbed 10-12 times that day. It was horrific. I regret not getting the pre-exposure vaccines for my sons in Bangkok like I originally planned. You live and learn. Ohh that sounds horrible!! It really is a shock when we are so used to all the animals being safe (and not aggressive), we appreciate it much more now! And it’s so hard because we all want to help the cats and dogs, as I’m sure you felt too, but the risk is huge! Have you had post bite rabies shots? Seriously!! It’s the only 100% fatal human disease. It scares me to death but we haven’t had an incident in 5 years on the road.